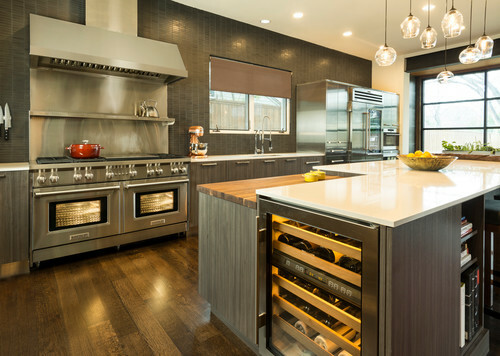 When a professionally trained chef brings Napa Valley style to Dallas, spotless stainless steel appliances are warmed by touches of live-edge walnut, handmade tile and smoky pear wood laminate. A special set of shelves and rolling glass panels replace a traditional pantry, and a coffee menu drawn on a chalkboard conceals a hot-water heater. Herbs grow out of a piece of burled wood in the middle of the island. The mash-ups are unique, balanced and functional for homeowners who take their kitchen seriously but also want to relax here. The bank of stainless steel appliances and cabinets sets the professional tone in this kitchen. The stainless steel toe kick, hardware and range vent hood follow that lead, while walnut accents, handmade backsplash tile and wood laminate cabinets warm the space. “My clients also have a home in Napa, and she was looking to bring some of that Northern California vibe to her Dallas home,” designer Abby Smith says. 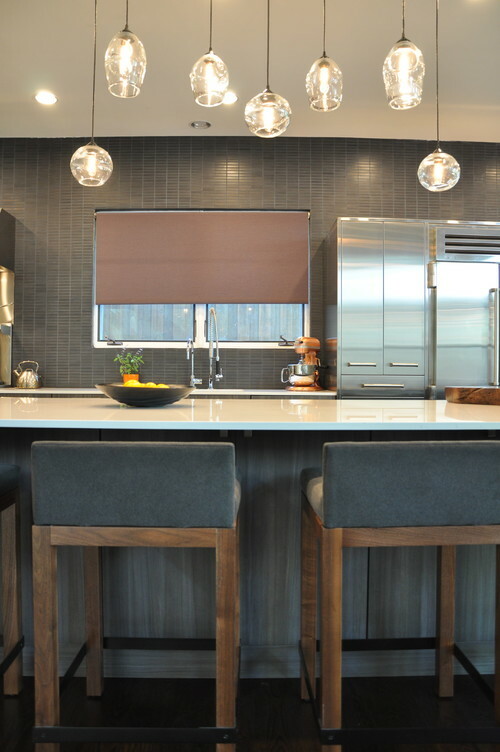 Smith introduced natural elements like live-edge warm wood to capture that feeling. For example, a wonderful custom piece of burled walnut was sourced from California and turned into a key piece of the island. A hole cut in the middle holds a custom-fabricated metal planter where fresh herbs grow. This end of the island is closest to the dining table and provides a serving surface. One of the major parts of the renovation was getting rid of a utility closet and replacing it with this prep area and coffee bar. The shelves are live-edge walnut. 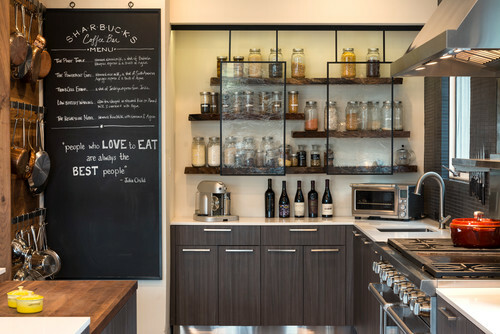 The chalkboard lists the curated daily coffee selections and conceals the water heater. This area takes the place of a traditional pantry. 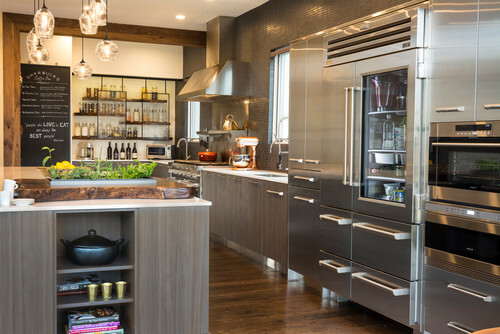 “I placed rolling glass panels to serve as pantry doors,” Smith says. 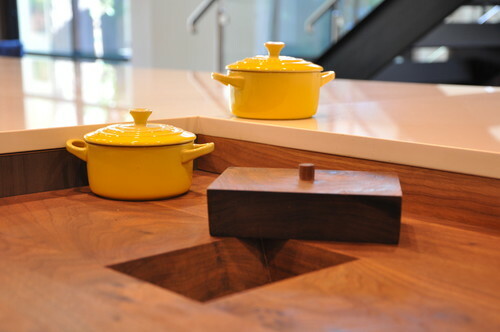 “It provides a sense of separation.” To the left, pots and pans hang from hooks, backed by another piece of walnut. The first floor has an open design. Halfway through the project, the homeowners decided that while they were at it, they should add a dining room as well. The space (right) used to be an exterior porch. The homeowners run their consultancy business out of their home when they are in town, so they often hold meetings here. The dining table can become a conference table, and the owners can feed their employees a great meal at break time. The island is split, with cookbook shelves on this side and the burled wood piece bridging the gap between the two base pieces. The floors are oak. “They had a lot of movement in them, so we stained them very dark,” Smith says. 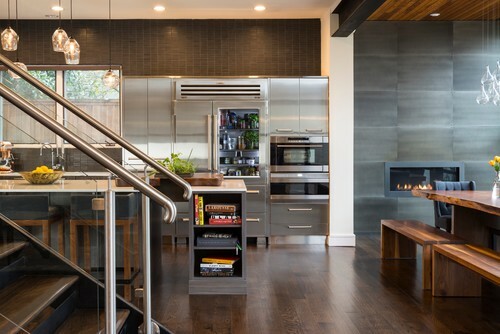 The dining room’s custom sheet-metal fireplace surround continues the look of the professional appliances in here but changes it up with a darker finish. They had to add the massive beam for structural support after removing the exterior wall, and its look accentuates the industrial style of the adjacent kitchen. The large windows and the existing wood ceiling maintain a bit of the original porch feeling. 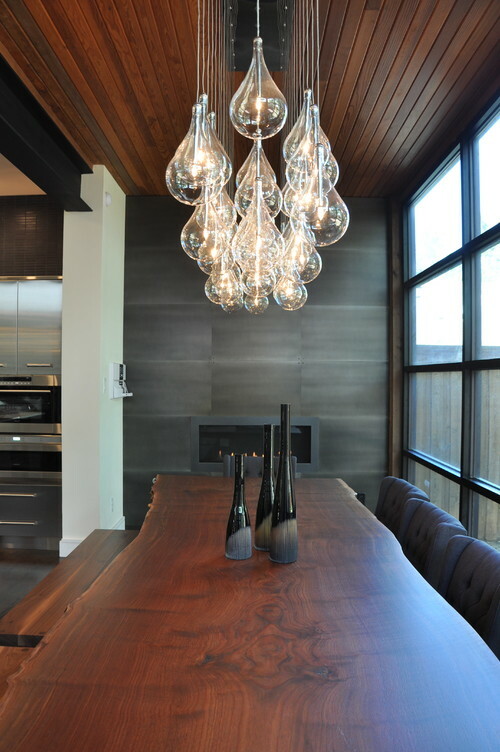 The live-edge walnut table and the wood benches connect it to the kitchen. The top of the custom-made table was sourced from California. Smith custom designed low-profile counter stools to fit the the room. Their bases are rich walnut that picks up on the other woods in the room. The fabric is a high-quality Ultrasuede that has a luxe look but can be wiped down completely. Brookhaven Cabinets made the cabinets using smoky pear wood laminate. The toe kick on the island is matching laminate, and the toe kick around the perimeter is stainless steel. The countertops are durable quartz. The wine refrigerator faces the coffee bar, creating another good prep area — this one for cocktails. Just over it to the left, a cutting-prep area has a special detail that was on the home chef’s wish list. This hole in the chopping block leads to the trash. It enables the cook to scrape leftover bits directly into the bin when chopping. The top covers it up when not in use.